NOME — Bethel musher Pete Kaiser pumped his fists in the air early Wednesday as his eight-dog team trotted across the finish line to win the 2019 Iditarod Trail Sled Dog Race. Even in the blowing snow hours before sunrise, fans packed the area around the finish chute. They whistled, cheered and chanted Kaiser’s name as he pulled in at 3:39 a.m. — just 12 minutes ahead of defending champion Joar Leifseth Ulsom. Alaska Native dancers and drummers performed. Dozens of people had flown in from Bethel to watch Kaiser notch his first Iditarod victory. It’s something Kaiser has thought about since he was a kid, he said. 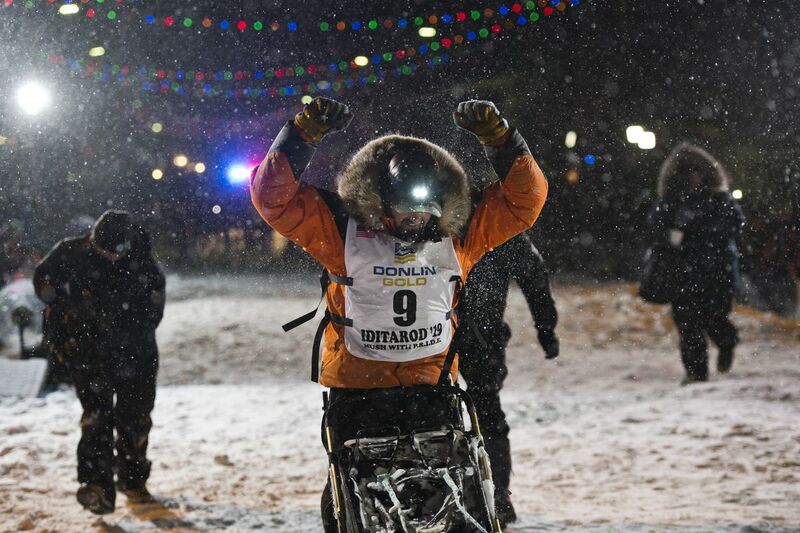 Kaiser is the first musher of Yup’ik descent to win the 1,000-mile race to Nome, and the first Alaska Native champion since John Baker in 2011. At the finish line, Kaiser shared a long, emotional hug with his wife, Bethany, and their two children, 6-year-old Ari and 1-year-old Aylee. He walked among his dogs, including leaders 4-year-old Lucy and 7-year-old Morrow. Morrow licked his face. The crowds’ cheers continued. “It doesn’t feel real yet,” Bethany said. Kaiser gets a new truck and a check for at least $51,000 for his win. And Southwest Alaska gets a young champion to cheer, a man who has stayed close to his roots rather than relocating to one of Alaska’s mushing hubs on the road system. “Our support system is incredible and the whole community and region and everybody out there,” Kaiser said. Kaiser and his sled dogs were still in the finish chute early Wednesday when 32-year-old Leifseth Ulsom and his eight-dog team arrived. Leifseth Ulsom, a Norwegian who lives in Willow, placed second at 3:51 a.m. It was the fifth-closest finish between first and second place in the 47-year history of the race. Kaiser and Leifseth Ulsom shook hands and hugged. At 9:34 a.m. Wednesday, 42-year-old musher Jessie Royer and her 11-dog team finished the race in third for a career-best finish. Royer splits her time between Fairbanks and Montana. Kaiser is a quiet, calm and focused musher, and a consistent top performer. This was his 10th Iditarod. He placed at least 14th every year except his rookie run. Before this year’s win, his best finish was fifth and he did that three times, including in 2018. 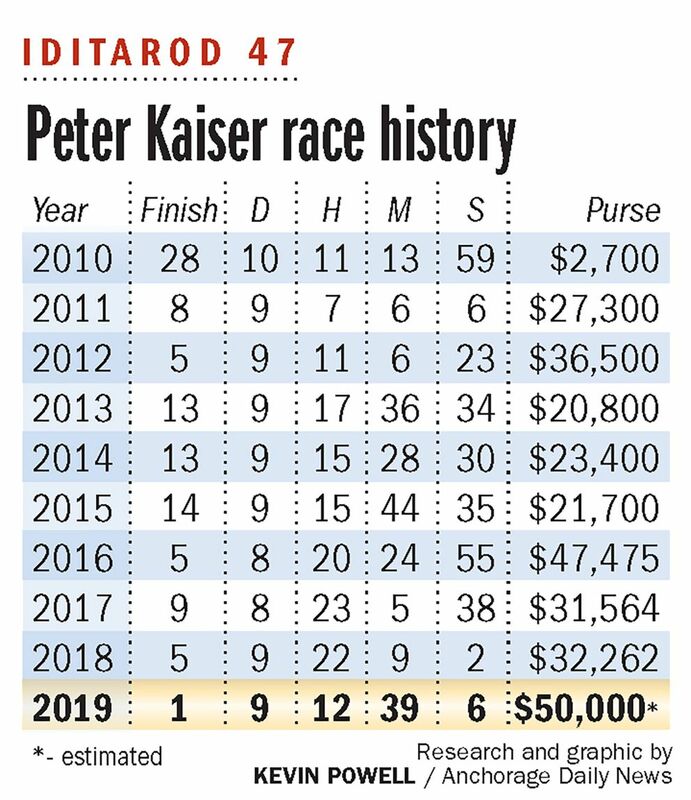 Kaiser is also a four-time champion of the Kuskokwim 300, a 300-mile race that starts and ends in his hometown. During this year’s Iditarod, Kaiser said, he focused on putting his team in a good position so they could take advantage of any competitor’s missteps. More than three-quarters of the way into the race, they saw their opportunity and they seized it. A late-race shakeup knocked Girdwood musher Nicolas Petit out of the lead and eventually out of the race. Kaiser surged ahead as the new leader, followed closely by Leifseth Ulsom. Kaiser described the run to the finish line as nerve-wracking knowing that Leifseth Ulsom wasn’t too far behind. They raced through the darkness into Nome and Kaiser kept looking over his shoulder for the man he described as a really good friend. Kaiser said he didn’t feel comfortable with his lead until he landed on Front Street early Wednesday, with the finish line just down the road. His winning time was 9 days, 12 hours, 39 minutes and 6 seconds in a race notable for its warm temperatures and slow conditions. It was the slowest winning time since 2009. At the finish line, Kaiser walked over to the crowd and was enveloped by hugs. His win is huge for Bethel, the region and rural Alaska, said Madelene Reichard, race manager of the Kuskokwim 300 in Bethel. Kaiser is the fifth Alaska Native to win the Iditarod. Athabaskan mushers won three of the first four races — Carl Huntington in 1974, Emmitt Peters in 1975 and Jerry Riley in 1976. It was 35 years before another Native won — 2011 champion John Baker, an Inupiaq from Kotzebue. Kaiser was born and raised in Bethel, home to roughly 6,000 people. He started mushing for fun as a kid with his family’s pet dog named Giant. “As soon as he’s getting big enough to need two dogs, we got another dog and then we got one or two more and then it just kept going,” said Kaiser’s dad, Ron. Kaiser and his sister competed in local Sunday races. As a high school senior in 2005, Kaiser won the 65-mile Akiak Dash. Kaiser tried college, but decided what he really wanted to do was train and race sled dogs full-time. He started building his own team in Bethel. He currently has 42 dogs. The race committee wants to encourage more family-kennel operations in Bethel that are self-sustainable, Angstman said. Dog mushing gets people outside and exercising, and it usually involves family participation, he said. Angstman arranged a flight at the last minute to see Kaiser pull into Nome, and so did Reichard. Others in Bethel also scrambled to book flights to make it to the finish line in time. “I know how much this means to him. I know how much this means to his family. I know how hard he has worked and continually works, so to see him achieve his dream? It’s an honor,” Reichard said. Reichard agreed. She said it’s great that children will see an Iditarod champion who they can identify with, who looks like them. Tegan Hanlon reported from Nome, and Beth Bragg reported from Anchorage.